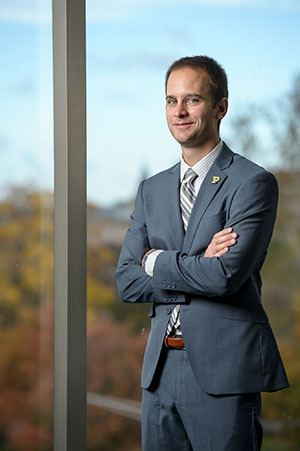 Adam Beal’s goals were no different than other graduate students arriving at Purdue’s Krannert School of Management looking to secure an MBA. He arrived in West Lafayette with aspirations of starting a company, but his journey took a slight detour when a colleague introduced Beal to Vibronix, a start-up focused on fighting cancer. Beal, a 2nd year MBA student, is Vibronix’s Vice President of Finance and is responsible for financial projections, business planning, business development and strategy. The company is one of 10 finalists in a nationwide competition sponsored by the U.S. Small Business Administration. Beal was granted a U.S. patent in 2014 for an exercise machine he invented and planned to start a business based on the device, but his attention turned to Vibronix. Vibronix’s product – MarginPAT – uses a novel technology to differentiate between healthy and unhealthy tissue in the patient during surgery in order to minimize secondary surgical procedures, save time and cut costs for patients and insurance. Beal works closely with Dr. Pu Wang, co-founder and CTO, and two post-doc students, Lu Lan and Rui Li. Beal’s business background brings balance to the team with his ability to access the market, design business models, formulate strategy and reduce risk. Beal’s journey started at Colorado State University where he studied Microbiology. He pursued an MBA with Krannert in 2014 after applying to 12 different schools.